I made this cake for Thanksgiving. The apples are rice cereal "treats" covered with fondant and hand painted. 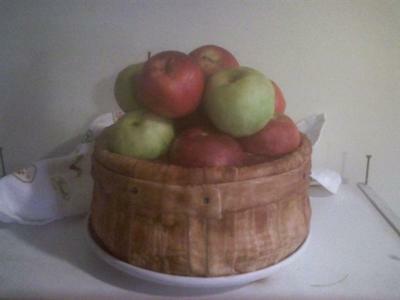 The basket is a yellow layer cake, also covered with fondant and hand painted. Thank you all for your lovely comments about my cake. I have not been at my computer for a while due to up-coming heart surgery. I will post more later. Again, thank you. wOW.... It looks so real. I was impressed by your skill and talent. So beautiful and your work is so fine. Love it...thanks for sharing. You are so talented! This cake is really awsome! The apples look so real. You would never guess it was a cake. Well done! What an awesome cake!!!!!!!!!!!! How cool!!!!!!!!!!!!!!!!!!! Lisa that is a really cool cake. I wish you would have given a little more information. How was the bowl made? Did you bake a reg. pan or a molded one? The apples look so real and how did you make the cereal treats? Send me an email. nrcourtney@aol.com Okay? Did you paint with gel or paste colors?